The pics of the fiesta of which Ernest Hemmingway wrote his famous book "The Sun Also Rises" (in German "Fiesta"). 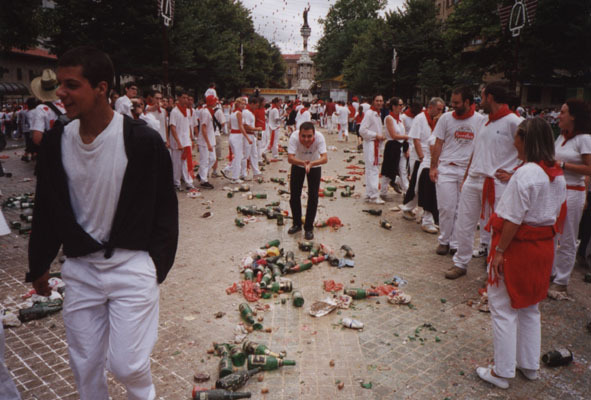 The fiesta lasts eight days, from Saturday till Sunday of the next week, the day of San Fermín is the 7th of July. 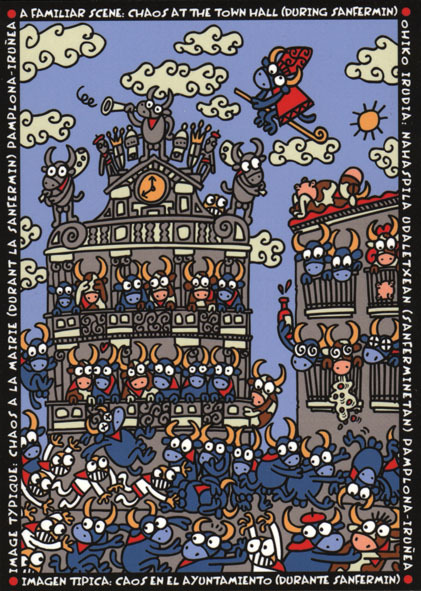 By the way, San Fermín is the patron of Pamplona. 1. 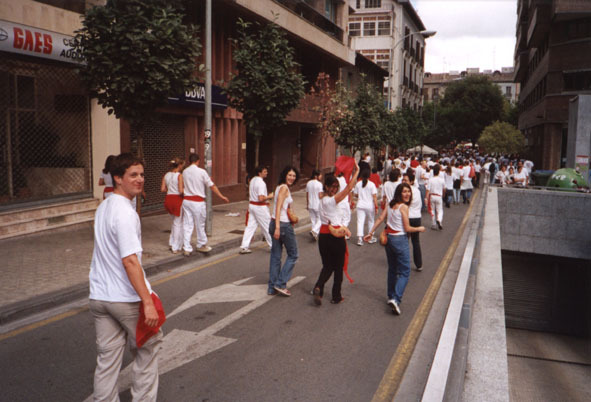 The run of the bulls along the streets of Pamplona ("encierro") hunting tourists, ehm, people, every day at 8 a.m.
2. The wearing of red handkerchiefs/scarfs symbolising blood strains of cut off heads (really true), or kind of red belts. 3. 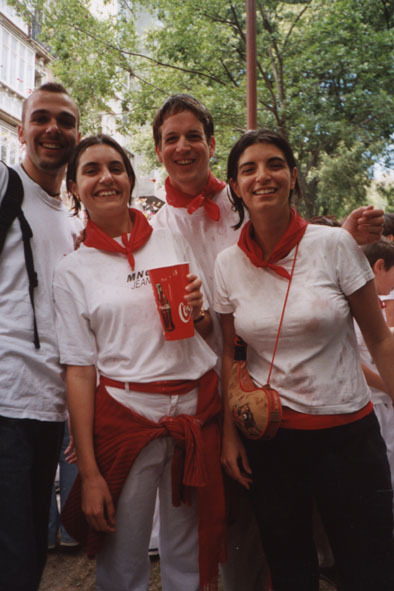 The wearing of white t-shirts or shirts and white trousers. 5. Fireworks every night at 23:00 h.
6. People sleeping on the streets and in the parks. 7. Simple hotel rooms of normally 15 euros per night now 300 euros. 8. State of emergencey 8 days - party non-stop (New York - the city that never sleeps...?!). 10. Yellow rivers on the streets - but not primarily because of beer. 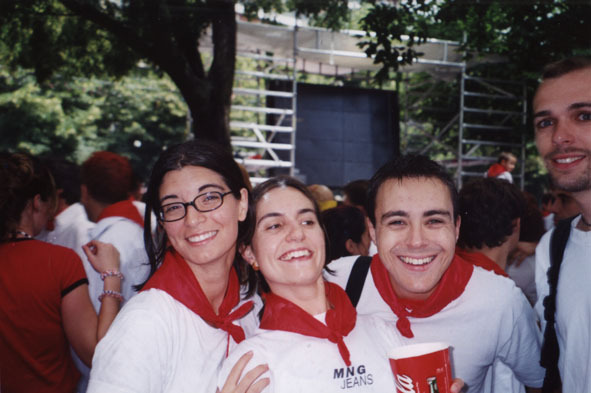 On the way to the Txupinazo, the inauguracion of San Fermines on the Plaza del Ayuntamiento (the city hall square). 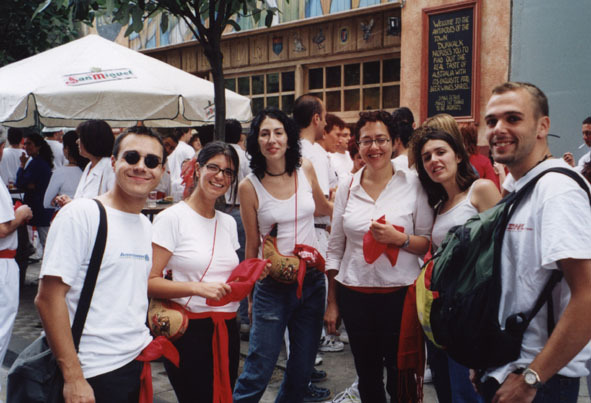 Tomasito, Esther, Ana-Cristina, Celia, Clara and Rune before the Txupinazo. 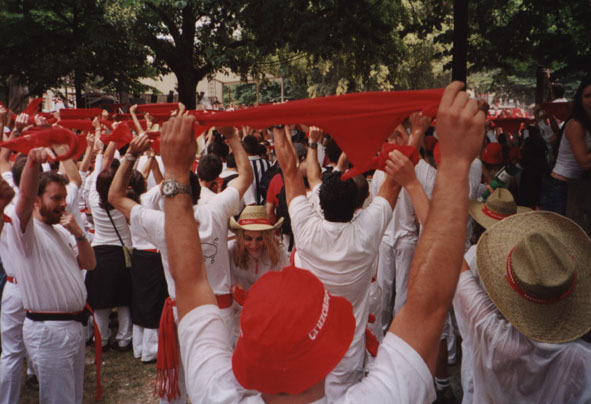 12 o'clock midday - raise the pañuelos (hankies) into the air. As you can see, also Tomasito has a red pañuelo! The fiesta starts with a rocket shot into the air. Then the people put their pañuelo on. Here Esther, Lara, Tomasito and Rune. And here you can see the first effects of the Txupinazo. The people also start to open bottles of champagne - but mainly not to drink them, but to splah it over the other people.. This photo documents the Plaza del Ayuntamiento after the Txupinazo. There's a layer of mud and slime on the ground. To get to the position on the Photo, I nearly fell down onto the slippery floor. Five seconds I tried to keep the balance. After having contorted myself like Keanu Reaves in the Matrix I managed to beat the gravity.